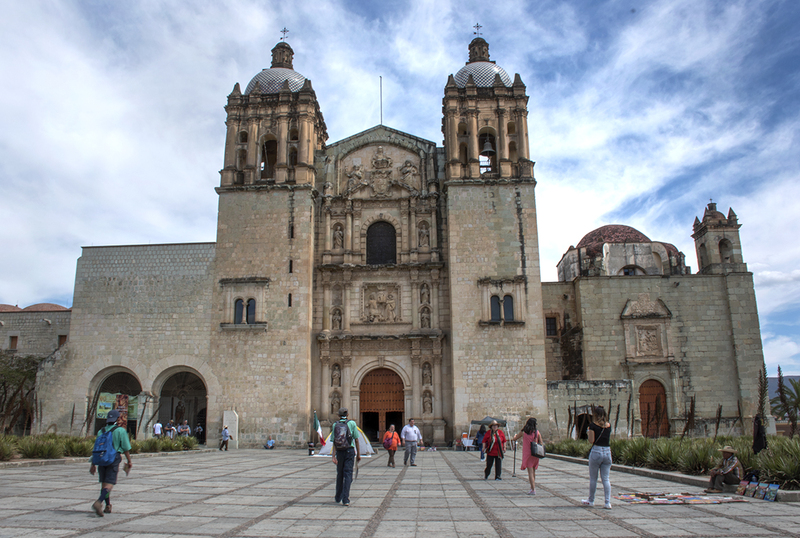 After a week basking on the beaches in Puerto Escondido we headed for the city of Oaxaca. Because we are no longer fond of windy bus trips in smaller vans, we opted to buy tickets on an ADO first class bus, even though the trip was supposed to be a couple hours longer. As it turned out we probably should have paid more attention to the actual route the bus was taking. 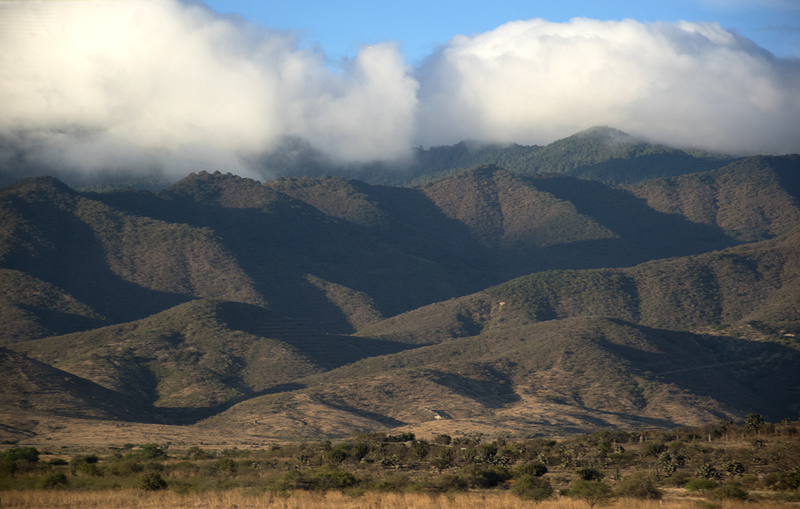 I began to get concerned when after an hour heading south we still hadn’t turned onto a highway heading towards Oaxaca. Finally, after we passed the highway turnoff near Huatulco I asked the bus driver why we were still heading south and he said we turn north at Salina Cruz. For those of you not familiar with Mexican geography, Salina Cruz is about 160 miles south of Puerto Escondido, in the opposite direction from Oaxaca. 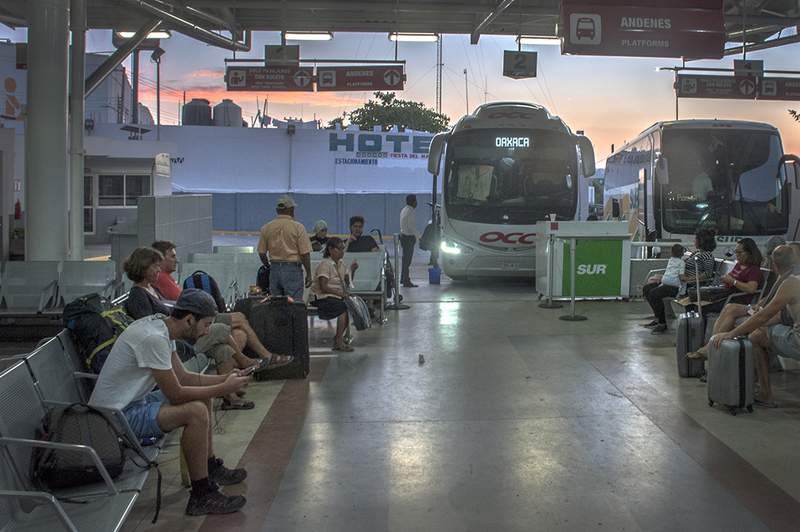 Eventually, after several stops in various towns we arrived in Salina Cruz, five and half hours after we had started. The highway from Salina Cruz is a major highway and we made good time but we still arrived in Oaxaca more than an hour later than scheduled, after an 11 hour bus trip. At almost a mile in elevation, the temperature in Oaxaca in February is warm but not oppressive, staying mostly in the 80’s. March will be a bit hotter and I believe April is the hottest month here. 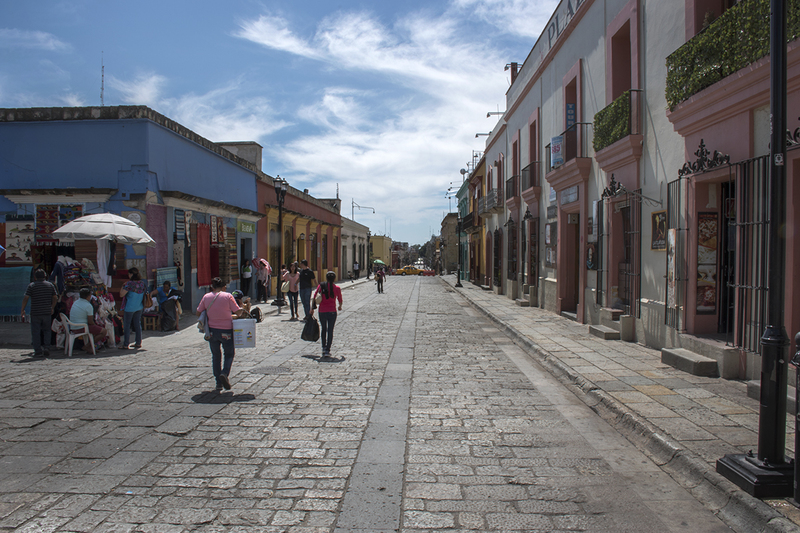 We spent much of the first week walking around the centro, getting to know the town. 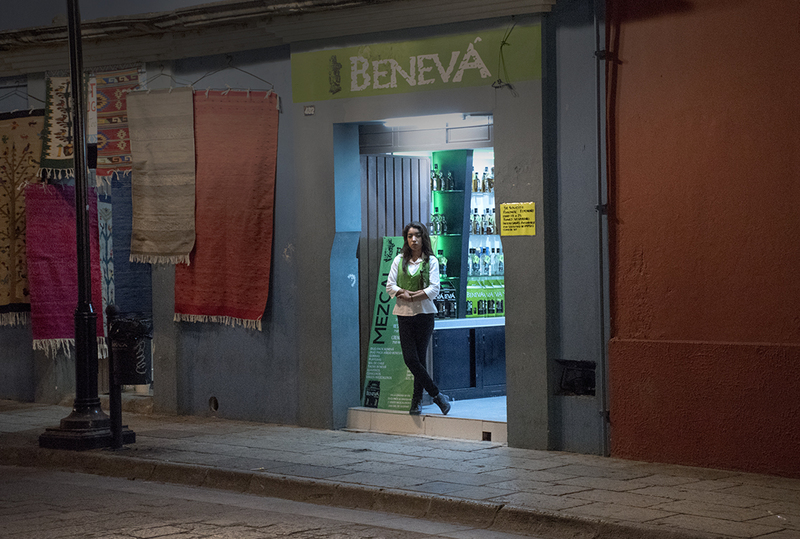 Our AirBnB is on the eastern edge of the centro, and stores and restaurants in Oaxaca are spread out across a larger area, not as concentrated as they were in San Cristobal de las Casas, so we find ourselves walking a lot more to find places to shop and eat. This has continued to be the case even after we have learned the town better and I can definitely say that we are getting a lot of exercise navigating Oaxaca. Looking out the bus window between Salina Cruz and Oaxaca city. The downtown area is very attractive, maybe not as charming as San Cristobal, but it has plenty of attractive colonial architecture, parks and plazas, as well as a large number of museums and attractive churches. The andador (pedestrian street) on Alcala is probably the most attractive walking street in the town and that is where many of the tourist attractions (and expensive shops) are located. The zocalo is our favorite one we have seen in any town in Mexico so far, with many local people hanging out there at all hours. It feels like the city’s living room, which is what a zocalo should be. Unlike San Cristobal, which had a single large public market, Oaxaca has many markets spread around the city. Depending on what you are shopping for you need to identify the market that sells those products and go there. The Mercado Merced, near where we live, has mainly food items for sale. Mercado Benito Juarez has a wide variety of handmade clothing and woven items, shoes, bags, hats, belts, backpacks, knickknacks, luggage, and household items, as well as foods, and quite a few mescal shops. Mercado Abastos has a lot of contemporary clothing and modern products, more like a US mall. Mercado 20th of Noviembre has lots of places to eat, bakeries, mole shops, and mescal and juice shops. There is also an Artesans Market which just sells items made by local artesans. 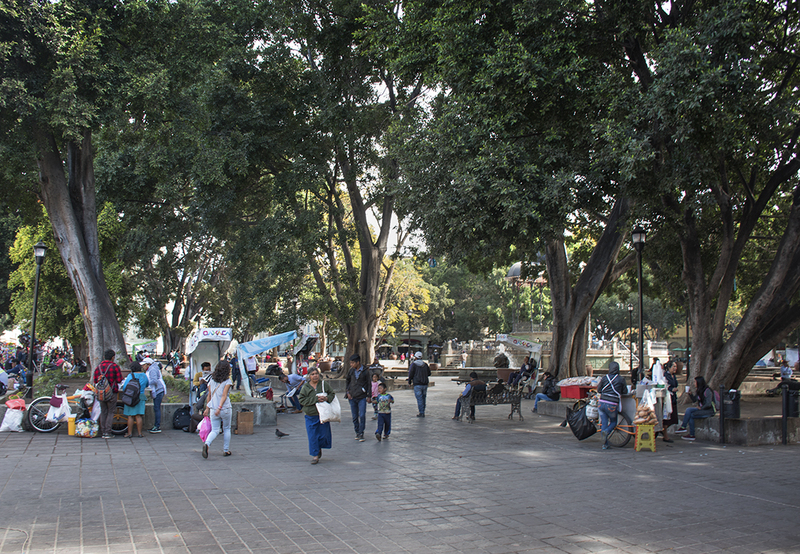 Our favorite markets are Benito Juarez and the Artesans Market. While wandering around the town we have discovered that Oaxaca has an overabundance of certain types of shops, in particular shops selling mezcal, chocolate (and often mole), desserts, ice cream shops (especially La Michoacana shops which seem to be everywhere), street stands selling fresh fruit and fresh juices, optical shops, beauty shops, and dentists. 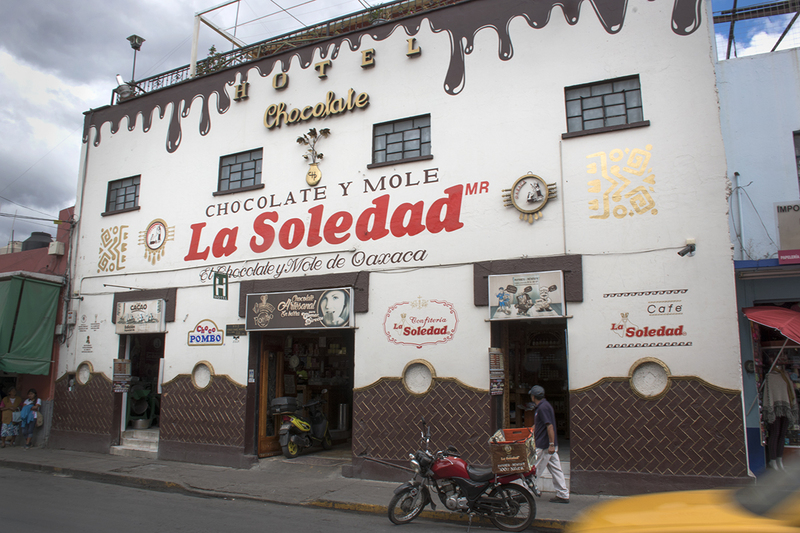 As everywhere we’ve seen in Mexico, the people here seem to eat a lot of sweet things. Unlike San Cristobal, where we didn’t encounter a lot of street stands selling tacos, there a lots of stands in Oaxaca where you can grab a quick taco or tlayuda. Tlayudas are like quesadillas only the shell is crispy. We have only encountered them in Oaxaca so far on this trip, and after eating them a couple times we have both decided we don’t like them much. La Soledad chocolate and mole store. We’ve seen a lot of gringos here, especially older couples, often in the main tourist areas or markets, so we conjecture that these are mainly tourists or travelers, rather than expats. The city is a magnet for food tourism and I suppose that attracts a demographic with money to spend in the better restaurants and mescalerias in town. I keep reading everywhere what an amazing food town Oaxaca is, but I feel this should be amended to include the phrase “if you have a lot of money to spend”, because at the lower cost end of the restaurant spectrum, which we mainly inhabit, I don’t think the food is any better, or even as good as the food we got in San Cristobal for less money. I have no doubt that if you have $40+ US or more per person to spend on a meal in Oaxaca, you can get a great meal here. This is not to say that we are eating badly for low cost in Oaxaca…we aren’t. We have found many good lower cost places to eat, but for some things we did better in San Cristobal. For example, we haven’t found any low cost wine bars in Oaxaca so far. We also haven’t found any good low cost French bakeries in town. Groceries and meats, fruits, and vegetables in the mercados and grocery stores are about the same price here as in San Cristobal. One thing I have found in Oaxaca that I really like are tortas, which are like Mexican paninis, usually selling for about $1 each. Oaxaca does have a greater selection of all products available, probably because the town is larger and closer to Mexico City. There is an extensive industry in Oaxaca promoting products made by local artesans: weavings, embroidery, pottery, alebrijes (brightly painted carved wooden animals), and artisanal mezcals to name a few. Ger feels that the weavings and embroidery here are of more consistently high quality that what we found in Chiapas. Local travel shops advertise a variety of day trips you can take to a variety of local villages, each specializing in a particular product they are known for producing. If you are on a budget you can take colectivos to these same villages and save yourself a lot of money. In any case, you can probably find the same products for sale in many places in the city of Oaxaca for similar prices that you would find in the villages. In general, due to the combination of nice weather, good food, plenty of local attractions and interesting things to do, comfortable city environment, we can see why Oaxaca has become one of the most desirable destinations in Mexico. Luc k Favors is a website for those of you who dream of leaving a life of 40-hour work weeks and two-week vacations behind. 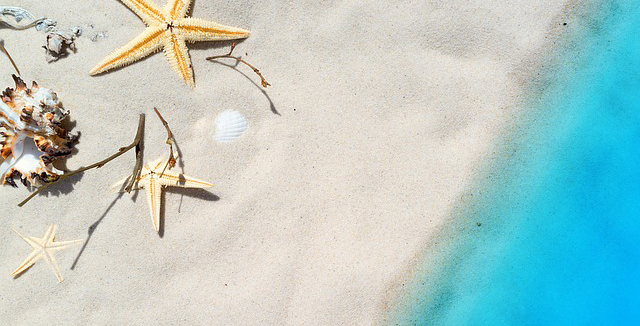 We'll give you information and motivation to help you create a new mobile semi-retirement lifestyle for yourself which will allow you to travel more, work less, and do the thing you really want to do with your life.